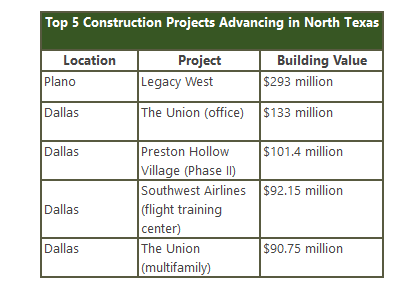 ​​DALLAS-FORT WORTH - North Texas is bucking the rest of the United States when it comes to investment in new construction, with DFW seeing a 7 percent gain year-over-year in development costs for a total of nearly $10.7 billion of construction underway. Toyota's corporate campus in the $3.2 billion Legacy West mixed-use development in Plano topped the construction list with a building value of $293 million—in pure construction costs—for the office portion of the campus. In all, Toyota North America expects to invest $1 billion in the upcoming relocation to Plano, which includes construction costs. There is a greater number of larger projects—defined as developments with a construction value of $50 million or more—advancing in the region with 13 in the first seven months of 2016 compared with seven for that same time period last year. North Texas also has a mix of projects ranging from corporate campuses to urban mixed-use development to health facilities. ​Be sure to browse Dallas-Fort Worth Market Research​ for data on office, industrial, retail and more!